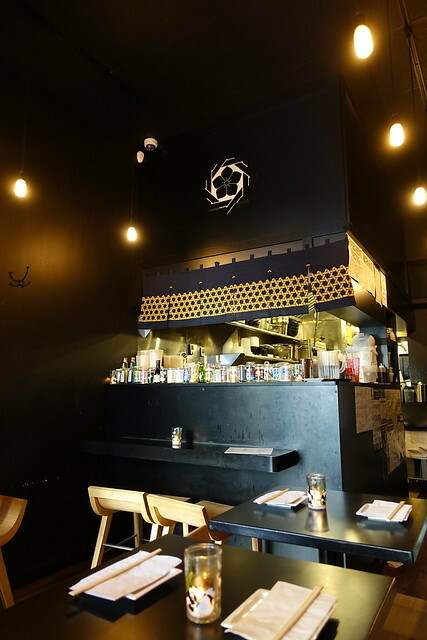 Last week, the team from Sushi Dojo (my review can be found here) invited me to check out its new-ish restaurant, Dojo Izakaya. 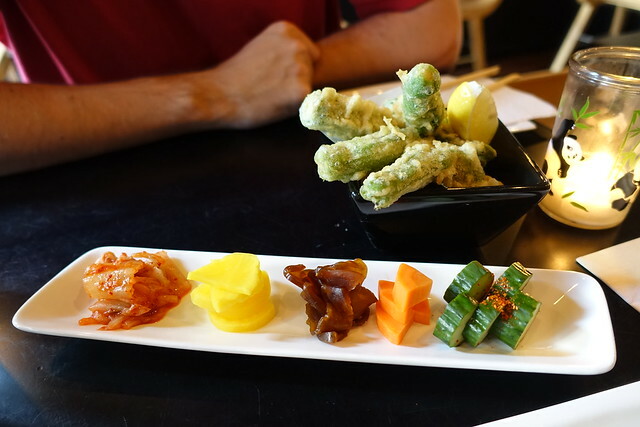 Marcus and I have been huge fans of Sushi Dojo since our first visit, so anything cooked up by Chef David Bouhadana immediately had my attention. 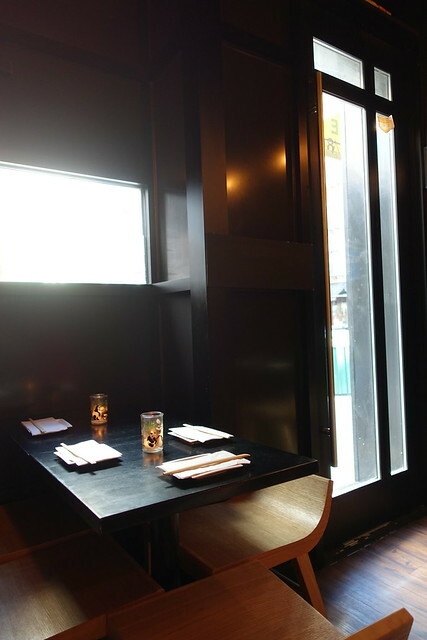 Dojo Izakaya is a traditional izakaya, a casual Japanese drinking establishment that serves fare that complement its beverage offerings (essentially, a Japanese gastropub). Upon our arrival, we were welcomed by Lindsay, the restaurant's friendly server who took care of us for the duration of our meal. The dining room, albeit small, is cozy and intimate, inspiring shared bites and conviviality. And what a vibrant selection of sake this izakaya boasts, many of which are not served in the traditional glass bottle, but in a glass "cup" shaped like a can -- it might not be a real novelty or anything, but I was certainly fascinated with them. Plus these cups have been repurposed as the restaurant's drinking glasses -- how nifty! We decided to try our luck with the sake menu by diving headfirst into a junmai daiginjo ("Purest Pleasure" by Wakatsuru) and our ever persistent favorite, a nigori (One Cup by Ozeki). 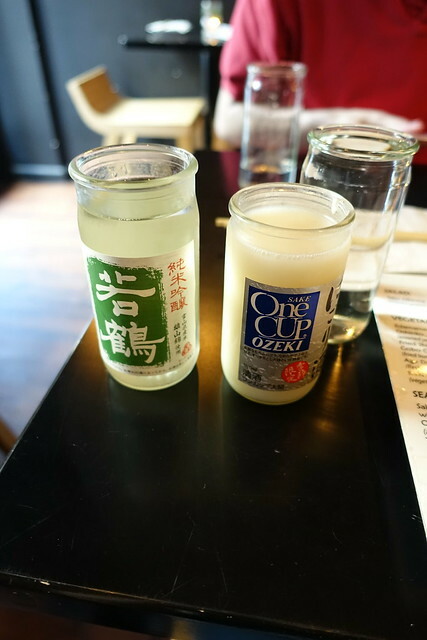 Daiginjo, per the menu's apt description, is super premium sake with complex flavors and fruity aroma, while nigori is a cloudy, unfiltered sake. Marcus and I took a sake class awhile back at New York Vintners, and our instructor had said if there was anything to take away from class was ginjo and daiginjo. Clearly that stuck with us, because Purest Pleasure was indeed quite a satisfying sake with its smooth, well-rounded savory taste. As for this nigori, it possessed a " creamy rich flavor balanced with an elegant sweetness and a refreshing aftertaste." View of the dining room's other side. Next came the gobo chips served with spicy cod mayo. These chips were like French fries that used burdock root instead of julienned potatoes. 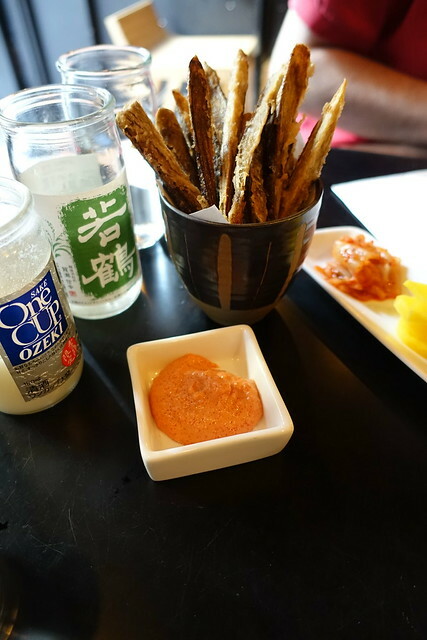 The taste reminded me a mix of sweet potato fries but with a firmer, carrot-like). The spicy cod mayo complemented these very well -- a winning combination that brought out the flavor from the burdock root. Definitely worth trying! Probably one of my favorite dishes of the evening were the takoyaki (octopus fritters) topped with bonito flakes, takoyaki sauce, and Japanese mayonnaise. The resulting design from the zigzagged mayonnaise made these little orbs look like bumble bees, and what bumble bees of flavor these were! 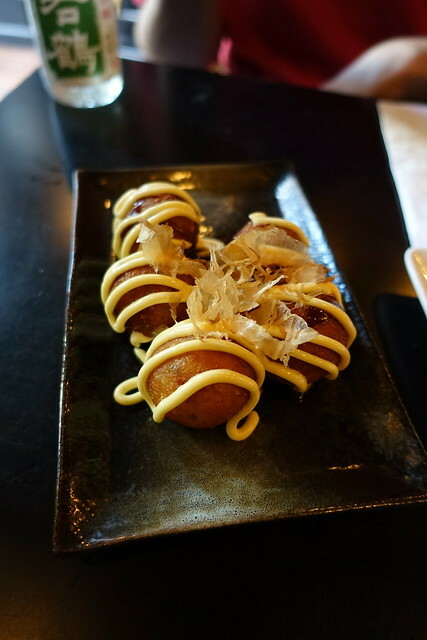 They were perfectly fried with the ideal ratio of batter and chopped octopus meat (many times, there are hardly any chunks of octopus meat to warrant them being called takoyaki) which made these for very enjoyable bites. We also ordered a few kushiyaki (skewers) by the piece -- from top to bottom were chicken, guyton (beef tongue), and kalbi (beef shortrib) served with togarashi seasoning. 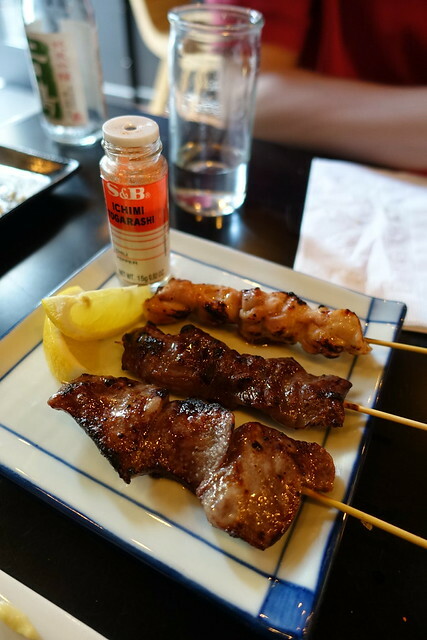 The skewers at Dojo Izakaya are of the purist approach (just enough seasoning and light marinade) where the flavors of the meat speak for themselves -- well-charred, evenly marinaded, and incredibly juicy. Be sure to order a few of these -- you'll be glad you did! 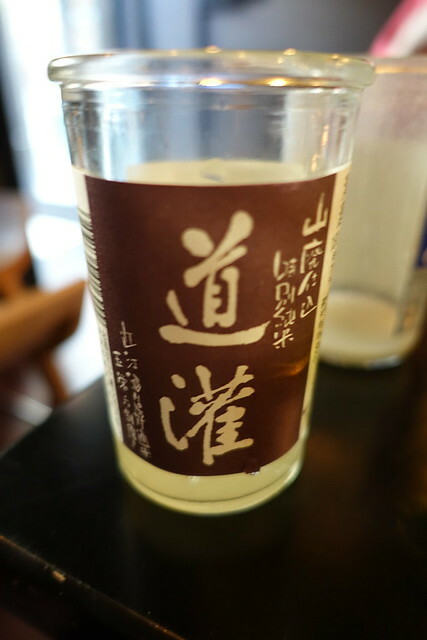 We shared another cup of sake, this time a junmai (pure sake with intense flavor and low fragrance) called Dark Sleeper, which was quite well-balanced in smoothness and strong flavor, making it our favorite out of the three we had that evening. 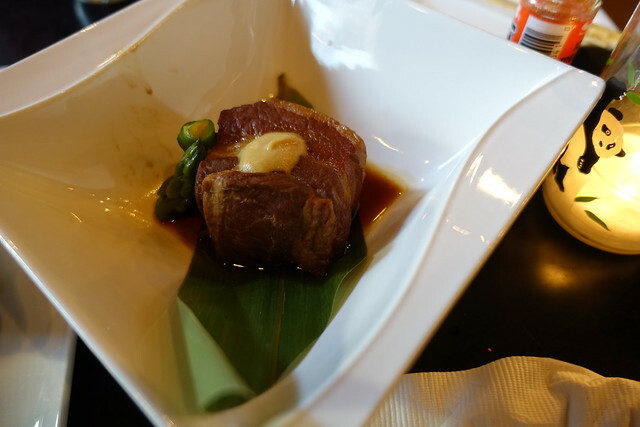 Our first selection from the meat section of the menu was the buta kakuni (braised pork belly) with Japanese mustard. Thoroughly marinaded, the pork belly must have been braised for a lengthy time at a low temperature as it was so tender that the meat fell apart very easily. 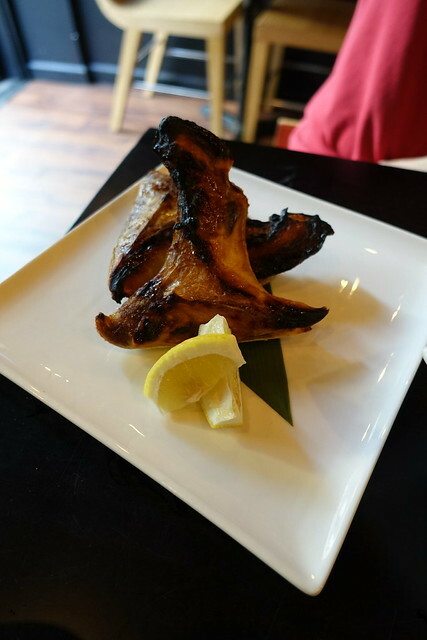 One of favorite things to order at an izakaya (or from the cooked section of a Japanese menu) is hamachi kama (salt-grilled yellowtail collar), so imagine my excitement when it was offered at Dojo Izakaya. In each hamachi (yellowtail), there are only two (one collar per side), and it is the fattiest and juiciest part of the fish, typically grilled or broiled until the skin is crisp and the interior is just cooked through. At Dojo Izakaya, the preparation was no exception -- the meat was incredibly juicy and savory, simply salted with a squeeze of lemon juice. The two collars here had a very brilliant char to them without overcooking the meat. You better believe that Marcus and I scraped every last bit! 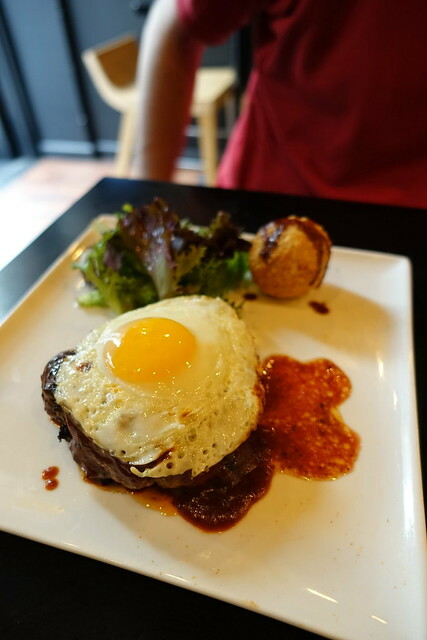 We also tried the Hamburg steak (pure ground beef steak with housemade demi-glace sauce topped with a fried egg). The homemade sauce is definitely one of the more notable things of this dish, which paired really well with the perfectly fried egg -- great combination of textures and tastes. 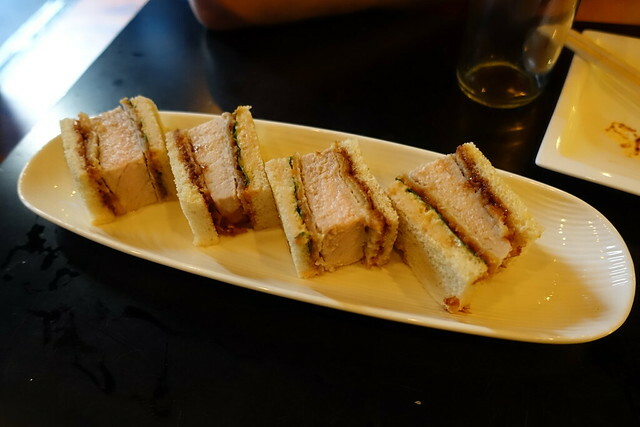 The last dish of the evening was the katsu sando (pork cutlet sandwich). The bread-to-pork ratio seemed to be a bit off -- white sandwich bread might not have been the best choice for the thick-cut slabs of pork cutlet, as it made it difficult to eat without the sandwich contents slipping/falling out. While this wasn't my favorite dish execution-wise, I appreciated the idea of it. 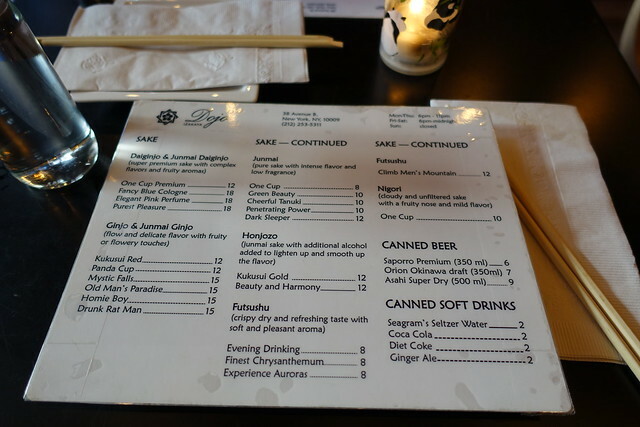 Findings: Marcus and I had a fantastic time trying out the wide spectrum of dishes from the varied yet well-curated menu at Dojo Izakaya along with the delicious offerings of cup sake. While the space might appear to be small, I appreciated the cozy atmosphere the restaurant creates for its patrons with thoughtful fare and drink, inspiring intimate and lively conversations. Our server Lindsay made the visit that much more enjoyable with her cheerful and welcoming demeanor. 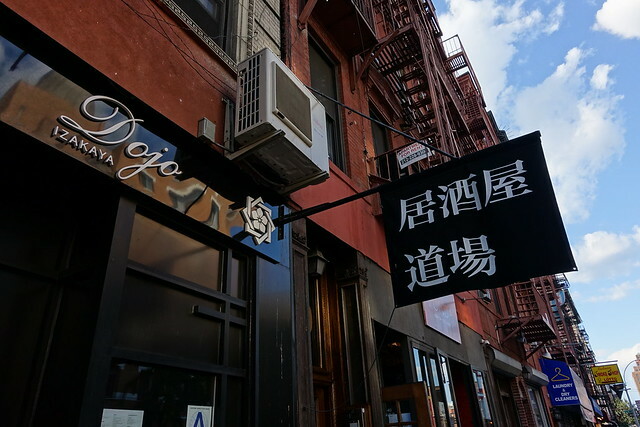 So if you find yourself in the East Village with your closest friends, a detour to Dojo Izakaya is a must for quality and authentic Japanese eats and sake at reasonable prices -- I know we'll be back soon for sure! Price point: $8-15 for each small plate, $3-5 for each skewer, $10-18 for each cup sake.